Another fab polish from Treasures By Tan. 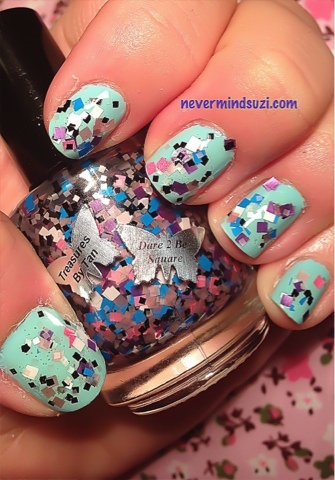 Dare To Be Square is a brilliant glitter topper! Full of squares as it suggests in blues, pinks, purples, silvers and blacks, in a variety of different sizes. The undies were an issue for me, I wanted a colour that would make all of these glitters pop, so I finally settled on Nails Inc - Royal Botanical Gardens. I love this mani, square glitters are fab in general but this mixture is brilliant! !